For the past ten years now, the Sanctuary Resort’s chef Beau MacMillan has been hosting “Lunch and Learn” at his Elements restaurant inside the resort in Paradise Valley, AZ. If you have never stayed or at least visited the Sanctuary Resort, it is highly recommended. It certainly doesn’t get the same notoriety as other mega-resorts in the valley, but I think they like it that way. It is very private, secluded, and intimate in the sense of its scale. I f you want to go and be seen, maybe even check out the latest advances in plastic surgery – show up at the W hotel in Scottsdale. However, if you want a retreat, to relax and recharge at – head to the Sanctuary. Situated on the north side of Camelback Mountain Its styling is a cross between modern and contemporary architectural features. Upon check in we were informed that they had overbooked their Mountain Casitas so they had to upgrade us to their private residence. So instead of a $160 a night hotel room, we had a 3 bedroom, 4 bath, mansion complete with its own private pool, tennis courts, cedar lined sauna, and work out room. It was kind of like winning the lottery as the place normally rents for upwards of $2,000 a night in the high season. Getting back to “Lunch and Learn”… for starters the word lunch is sort of a misnomer as they offer a “Dinner” and learn on Friday evenings and a “Lunch” and learn on Saturdays Dinner on Friday retails for $150 per person and the lunch on Saturday is $75 per person. What do you get for plunking down all these rupees? A fantastic dinner cooked by a world class chef followed afterwards by a one on one Q&A session. In our case Geoffrey Zakarian: the proprietor and chef at the Lambs Club in NY; and Food Network personality (think the tough judge on “Chopped”). 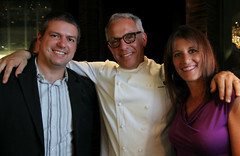 Zakarian prepared a four course meal, and plied us with copious amounts of paired wines. Due to Beau MacMillan’s growing respect and notoriety in the culinary world he has been enabled to attract more and more of his peers to f ly out to Phoenix and participate in his Lunch and Learn program. On the all star list for this summer, in addition to Geoffrey Zakarian, is Robert Irvine (of “Dinner Impossible”), Marcus Samuelsson (of the Food Network, Harlem’s Red Rooster, and guest chef to the White House), the producers from “The Best Thing I Ever Ate”, and local acclaimed chefs Aaron May and Matt Carter. 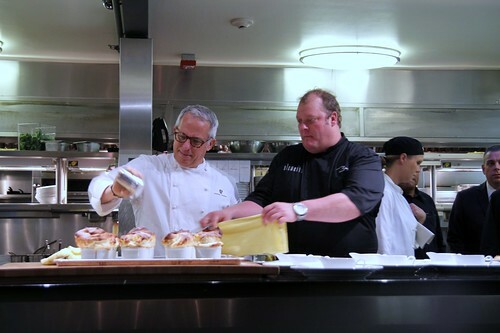 The program is just as much a lesson for dinner guests as it is for MacMillan’s staff to learn, collaborate and share in techniques with their peers. Now we have dined at Elements on several occasions, but this “Lunch and Learn” experience is totally different. First of all the dining room and view at Elements is something else – million dollar views of the valley, and top notch service. But for this event you dine at “Table 12”, a private 12 top dining room lined with wine bottles on one side, and sliding wall-to-wall glass doors looking on into the kitchen line on the other side. So you are watching Zakarian prepare your meal as you are dining on his first course. Its like sitting in the audience at an Iron Chef episode watching Zakarian, MacMillan and his team prepare your meal. MacMillan makes his guests feel like a million bucks in every aspect of the experience from the: attentiveness of his front of the house staff; the caliber of the visiting chefs he invites; the quality of the food; to the one on one conversation – complete with his experiences working on shows for the Food Network, to all night benders in the Bronx. Everyone who can afford it, especially those who live in the valley, should try and make at least a once a year experience at MacMillan’s “Lunch and Learn” at the Sanctuary. In the below video Chefs Zakarian and MacMillan discuss the aspects of working in their restaurants versus TV, and the way Food Network has changed their business. In the last week of April 2010 my wife and I traveled to South Korea to pick up our 13 month old daughter. She is our second child from Korea and this was our first trip there. Seoul is an amazing and varried metropolis – my hope is that we captured exactly that for memories of their previous home. A close friend recently inspired me to try making a short film from the experience – below is my attempt at a trailer. Salad Lyonaise, originally uploaded by Kyle Strickland. Salad Lyonaise is a classic French salad with poached egg, and a dijon, red wine vinegar, bacon dressing. You can find it on the menu of just about any French restaurant here in the states. Thomas Keller’s Bouchon offers it at their three locations in Yountville, Vegas, and Beverly Hills. Although he calls his Frisée aux Lardons et Oeuf Poché. Keller disciple Matt Carter adds spinach to his version at the Zinc Bistro here in Phoenix. I recently read about James Beard’s Rising Star Chef Sue Zemanick’s version in Southwest’s Spirit Magazine this past month – and figured I have to try this in the home test kitchen. It’s basically eggs and bacon with some green stuff – what could be better? 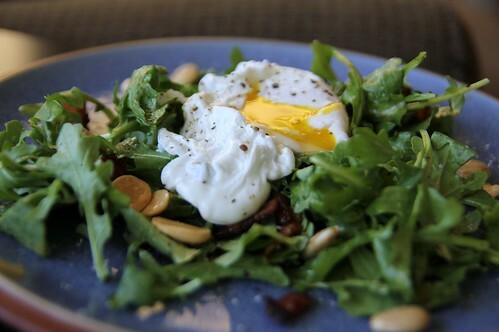 The poached egg’s runny yolk is perfect when mixed with the bacon vinaigrette dressing. I used rocket instead of the classic frisee and I added marcona almonds. Poach an egg in simmering water with a dash a distilled vinegar for a minute and a half – set aside in a bowl of warm water. Now crisp up 2 to 3 slices of chopped bacon – remove bacon, leave its oil. Then saute a fine chopped shallot in the rendered bacon fat, add a spoonful of Dijon, a couple glugs of white wine vinegar, your set aside bacon, mix. Now toss your bacon dressing in with your greens and marcona almonds. Serve with the poached egg on top. As you are eating break open the yolk and gently mix with the dressing in the rest of the salad. Entering the Ring, originally uploaded by Kyle Strickland. Looks like AMC is listening to the music and now offering a high end theatre going experience like Ipic is doing Scottsdale. The good news is you no longer have to travel to north stucco-dale to see a movie in style. 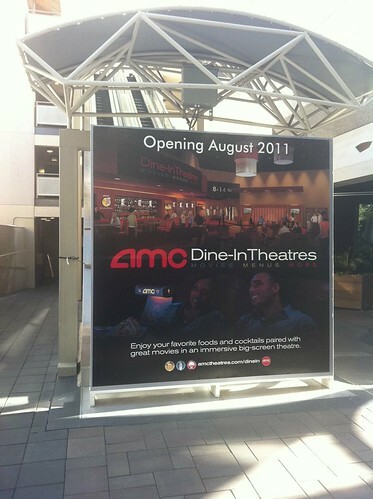 The AMC Esplanade at the Biltmore is remodeling – and they are bringing food and a liquor license to a neighborhood theatre near you. All I can say is – its about time AMC! Cuban at Kramer’s, originally uploaded by Kyle Strickland. If you ever find yourself in Washington D.C., late at night, near Dupont Circle – you must stop in at Kramer’s Cafe (attached to their bookstore) and devour their Cuban Sandwich. 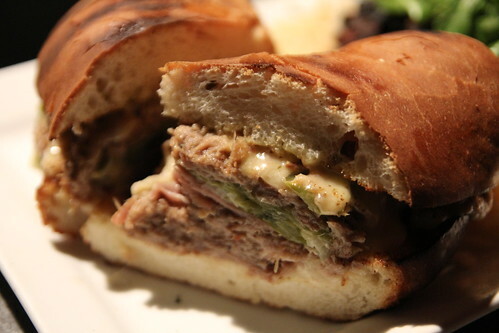 Slow cooked smoked pork shoulder, gouda, pickled jalepenos. Awesome. Noodles and broth right? Its way more complicated than that. The best place to eat at the intersection of Camelback and 10th Street in Phoenix isn’t Oreganos. Sorry it’s just not. It’s the Cherry Blossom restaurant located in the strip mall next to it. 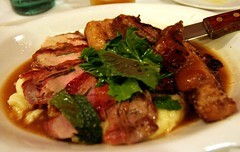 Cherry Blossom is an odd duck – half of their menu offers Italian food the other half Japanese. What makes Cherry Blossom so good is that it offers the best ramen I have tasted outside of Daikokuya Ramen in Little Tokyo, Los Angeles. For Phoenix Arizona, that’s saying something. Cherry Blossom offers their ramen Hakata style. Which is to say its origins were popularized in the Hakata-ku ward of Fukuoka, a city in the Kyushu province of southern Japan. But let us cut to the chase, at its root is Tonkotsu. 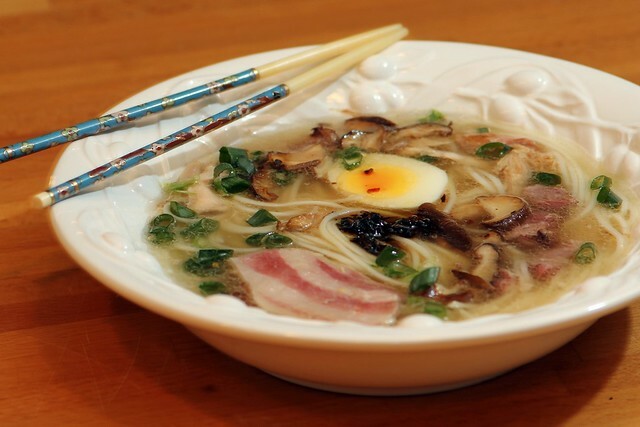 Tonkotsu, one of the four main ‘mother’ broths of ramen (think Carême’s four mother sauces of French cuisine), is essentially a stock made from simmered pork bones, and pork fat, which equals heaven in a bowl. 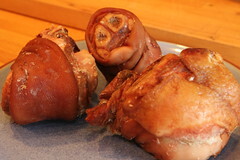 Trotters, ham hocks, pork belly, cast aside scrap and trim, are simmered for long hours, in some cases up to eight and beyond. The low simmering heat applied over long periods essentially melds the marrow of the bones and the collagen of the meat into a colloid type of goodness with the broth’s water (technically a hydrocolloid). This may not sound pretty but if you like bacon, and who doesn’t, you’ll love this. When done properly, and it is definitely a learned art form, it should appear milky white in color, be rich and full of flavor, and able to stand on its own. Noodles are thin and straight. 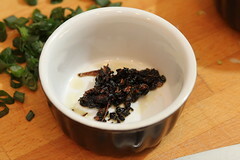 Toppings typically include green onion, ginger, shiitake, and māyu (a black oil made from charred garlic onion and sesame seeds). Daikokuya Ramen, in Little Tokyo, adds bean sprouts, bamboo sprouts and a perfectly soft-boiled egg to their Tonkotsu Ramen which totally makes their dish. While Daikokuya has the tastiest ramen I have had, Cherry Blossom’s Hakata ramen is definitely a must try when in the central phoenix area. 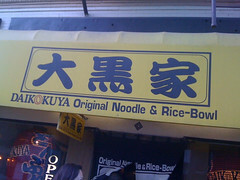 They serve their ramen with sliced Japanese style BBQ pork, green onions, and Kikurage (or “wood ear”) mushrooms. The place does a bustling lunch business from a very low profile location. I recommend grabbing one of the 4 seats available at the food bar, as it is right in front of the kitchen line, and it is fascinating to watch just 2 line cooks churn out all of the lunch covers. In a large pot add the water and pig parts. Bring to a boil then reduce heat to a simmer and cover. After about the first hour use a spoon to skim off the fat that has risen to the surface. Simmer for at least 4 to 5 hours (or longer) until the meat falls off the bones. At that point fish out the fallen off pork bones and skin, leaving in the rendered meat. In a small saute pan over medium heat add sesame oil, once hot toss in the other ingredients. Stir frequently to the point of charring the garlic and onion. Just before the point of burning them pull from the heat and spoon into a ramekin. Set aside for garnishing the finished ramen. Get a pot of water boiling for your pasta. 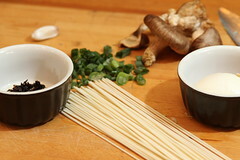 Once the broth is cooked and the bones and skin removed, add the whites of the green onion, the shiitake, the garlic, and grated ginger. Let simmer for a 1/2 hour. Add your pasta to the now boiling water until cooked. 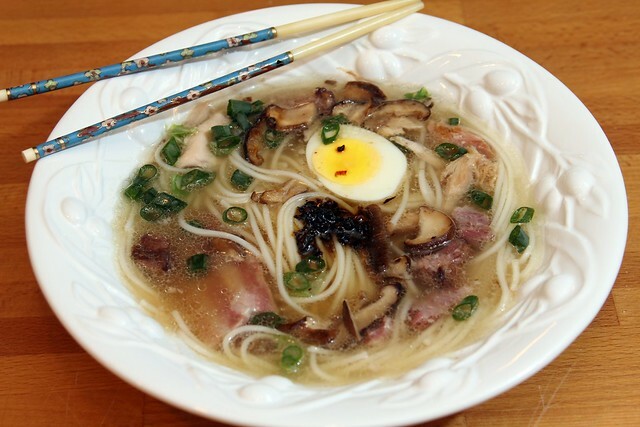 To plate spoon a couple ladles of broth into a bowl, drop in a twist of noodles, a soft-boiled egg half, a dash of soy, a sprinkle of green onion, and a bit of the mayu. Cleveland’s constantly shrinking population peaked by 1950; our river caught on fire due to pollution in the 1969; our sports teams are in shambles; everyone from John Elway, Michael Jordan, and LeBron James have kicked us in the nuts; and our politicians are all crooks. For those steadfast brave citizens who have put up with all this and remained – Jonathon Sawyer and his Greenhouse Tavern are giving them some serious good eats to ease the pain. Being a Cleveland expat in Phoenix, my ears perk up every time I hear something about the city, or watch something about it on TV. Unless of course it is a replay of “The Drive”, “The Fumble”, “The Catch“, “The Shot” or “The Decision”, I will tune in to watch. Flipping through the channels one evening I landed on Michael Symon – him being one of Cleveland’s celebrity chefs I naturally stopped to watch. It was the Food Network’s “The Best Thing I Ever Ate” program in which they interview all of their food celebrity personalities asking them to describe… well you know “the best thing they ever ate.” Symon was testifying about his affection for The Greenhouse Tavern’s Gravy Frites. The way Symon described the dish made your mouth water: crispy pommes frites fried in duck fat, smothered with melted mozzarella cheese and crumbled curd, then bathed in savory brown gravy. I’m drooling just typing it. So upon getting an invite from a close friend to attend an OSU Buckeyes game back in Ohio, I said we had to work in a stop to the Greenhouse Tavern to try these Gravy Frites. 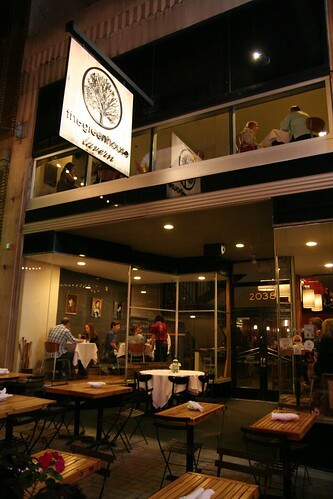 The Greenhouse Tavern is located in the East 4th Street Entertainment District of Cleveland, near the ballpark, Playhouse Square, and the Arcade. I guess all of that is called the “Gateway District” now? It is about two doors down from Symon’s now famous Lola. 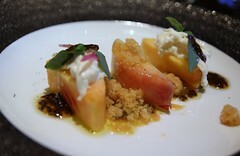 Owner and Chef Jonathon Sawyer’s modus operandi centers upon offering eco friendly, locally grown, sustainable food. He has also created the state’s first LEED certified restaurant. Gazing down the constantly changing menu, the French influence is obvious: steak and pommes frites, house made fromage blanc, foie gras steamed clams, coq au vin, etc. It is hard to imagine, having grown up in Cleveland, that one could actually eat like this in the Rust Belt. 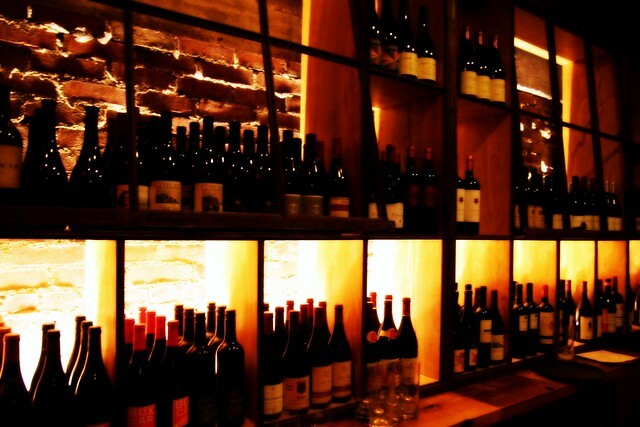 He also offers some unique and quite frankly awesome sounding dishes like Roasted Pig Heads with shrimp paste BBQ; Duck Pasta complete with duck livers, pecorino pepato, and duck skin cracklins; and Crispy Chicken Wings Confit – why not? Unfortunately the Roasted Pigs Head wasn’t on the menu the night of our visit so we settled upon the Foie Gras Steamed Clams, the Fifth Quarter, the Pan Fried Pork Chop Saltimbocca and of course the Gravy Frites. The Foie Gras Steamed Clams were tasty but if there was foie gras in the broth is was just waved in front of the boiling pot, much like vermouth in front of a martini glass. The mysterious Fifth Quarter is marked Market Price and simply described “w/ tasty bits” – so I had to try it. It essentially serves as the chef’s appetizer special. As luck would have it tonight’s Fifth Quarter was buttermilk deep fried chicken necks, backs, and gizzards – by far one of the best tastes of the night. I couldn’t agree with Chef Sawyer more – never throw out these tasty morsels. The buttermilk breading was awesome and the tasty morsels of meat were tender and cooked perfectly… I wanted seconds. The Pan Fried Pork Chop Saltimbocca was served with crispy fried sage, some fancy sounding mashed potatoes called pommes puree, herb salad, and a red eye gravy. 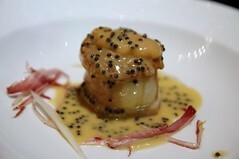 This dish too, was fantastic. What made it was the side of county ham, essentially a slow cooked pork belly, that was so flavorful and “melt in your mouth” that you wish you had a whole plate full of it alone. 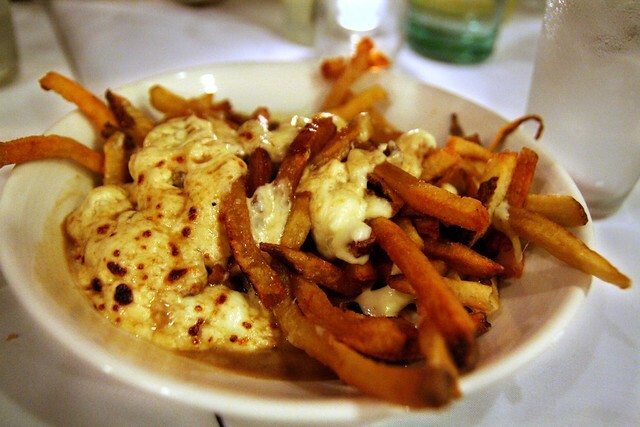 When we got to the Gravy Frites, I can’t say that I necessarily agree with Michael Symon. The fries on top had some nice flavor and were crisped on the outside, but once we got beyond those and entered knife and fork territory it was like eating a soggy mess of mashed potatoes, gravy, and overwhelming mozzarella. To be fair I think I get where Michael Symon was coming from when describing his favorite dish: he was coming from his restaurant next door, after an endlessly long dinner rush, being weeded all night, exhausted and famished, quenching a beer and some sustenance late at night. If those were the circumstances, then yes – this dish would in fact be amazing as it would serve as the perfect reward to hard nights work on the line. I could also envision throwing down a plate of Gravy Frites, after hours, and one too many drinks – much like the Primanti Brothers tradition in Pittsburgh. I then might believe that it was the “Best Thing I Ever Ate”. However, I in fact was just there for dinner and wanted to sample the full range of the restaurant’s offerings. All in all, the sum of the Greenhouse Tavern’s offerings, their mission, and their elevated tastes, definitely make me want to stop in every time I’m home in Cleveland.